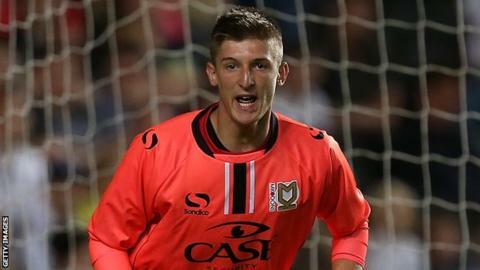 Truro City have agreed to extend the loan of teenage goalkeeper Charlie Burns from League One club MK Dons. The 19-year-old has played nine games for the Southern Premier League side, keeping three clean sheets. "He'll be extended to the end of the season. It's no coincidence that since he's come in our form's gone up," boss Steve Tully told BBC Radio Cornwall. "It's a matter of the paperwork being done, everything's been agreed, it's just got to be finalised." Burns has helped Truro rise into the play-off places since joining the Cornish club in November, with six of the nine games he has played ending in victories. "He's given the defence a real boost because they've got someone in there that they trust," said Tully. "He's done really well for us, for any young goalkeeper the biggest thing for them is playing games and he's been at MK Dons and he hasn't played any football. "He's got a lot of travelling to do, especially for games at Truro, but he seems to love to be here and MK are really happy with the way it's going."